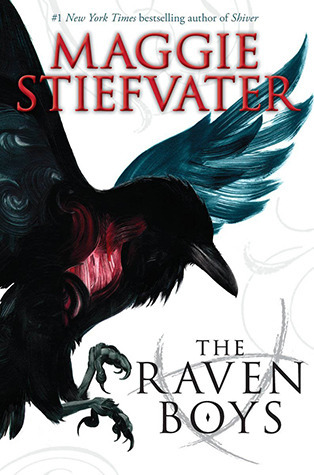 Confession #1: Aside from this first installment in The Raven Cycle, the only other Maggie Stiefvater novel that I have read is THE SCORPIO RACES, which I loved with a passion (and which you can read a Bookshop Talk review of here). Keep Confession #1 in mind as you read Confession #2, which follows, because Confession #2 may not hold water upon reading Maggie's other books (I suspect it will, though). Confession #2: Maggie Stiefvater is one of very few authors whose books I don't dare to put down, for fear that I'll miss something crucial. Her writing makes me feel like the action is happening right now, as I read. Have you ever had to go to the bathroom at the movie theater, but known that if you did go, you'd miss out on something really important? Yeah. That's how I felt about THE RAVEN BOYS and THE SCORPIO RACES. I had to devour them, because if I didn't, these books, which have a life all their own, would run off without me! What a feeling. I finished THE RAVEN BOYS a couple of nights ago, and after laying in my bed for a while, all stunned, I recalled that the last time I had felt that "wait for me!" way about a book was a year earlier, when I was reading THE SCORPIO RACES. So yes, I really like Maggie Stiefvater's writing. I'll let you know how I feel about her books that came out before THE SCORPIO RACES once I've finished them. Even if I don't love them, let it be known that I do love THE SCORPIO RACES and THE RAVEN BOYS, and I can't wait until Book 2 of The Raven Cycle comes out! Okay, enough of my gushing. On to the review. When news about this book first started making the rounds, I have to admit that I cringed a bit. The synopsis sounded so...high school. Giggle at me now, if you like. I am well aware that reading YA fiction often means reading about high school and all the stuff that goes along with it. But reading YA fiction does not always mean reading about high school, and it's those YA non-high school books that I tend to enjoy more than the high school-ish ones. Don't get me wrong, I've read plenty of YA high school books that I've really liked. But as a general rule, I don't love contemporary angst. And that's what THE RAVEN BOYS sounded like, which, after reading and adoring THE SCORPIO RACES, made me feel kinda sad. Oh, friends, lemme tell you, this ain't no high school drama. Forget your preconceived notions (if you have any, like I did) about forbidden love and misunderstood rich kids, and get ready to be blown away by phenomenal characters. Sure, the plot is great. Super exciting, and all that. I mean, I didn't want to "leave the theater" to go potty for fear I'd miss out on something, right? But it wasn't just the plot I was afraid of missing out on--I was afraid to miss out on some crucial information about the characters. They were so real to me, even as I was constantly being surprised by them. Maggie writes such incredible characters. Especially the boys. Blue was really, really interesting, and I thought she was exactly the female lead this story needed, but it was the Aglionby boys who gripped my heart and jostled it a bit. Especially Ronan. Ah, Ronan. You scare me a whole lot, young man, but I like it. At any rate, Maggie handles a huge cast of characters not just with skill, but with seeming ease. Every stinkin' one of her characters is different from the other, and they're all so believable. They all have super rich backstories, which we only get glimpses of, really, but you know those backstories are there, just under each page's skin. Because the characters are real people. No stock characters here, folks. And that's all I want to say about this incredible book, because if I say anything else, I'll ruin the story for you. And I don't want to do that. Do yourself a favor, though, and read it! Also read THE SCORPIO RACES. While you're reading those, I'll read Maggie's other stuff. Speaking of reading an author's complete works, have you ever done that? Whose? Did you love every book? Sound off in the comments! Mature Themes: death, murder, physical and psychological abuse, psychological trauma, magic (including tarot card-reading and seance-type stuff), prejudice, law-breaking (trespassing, speeding), etc. Great review Kim. I devoured this too and I can not wait to see where she takes the story next. Thanks for stopping by, Alexa! This really was such an amazing book. I'm excited for the next one, too!